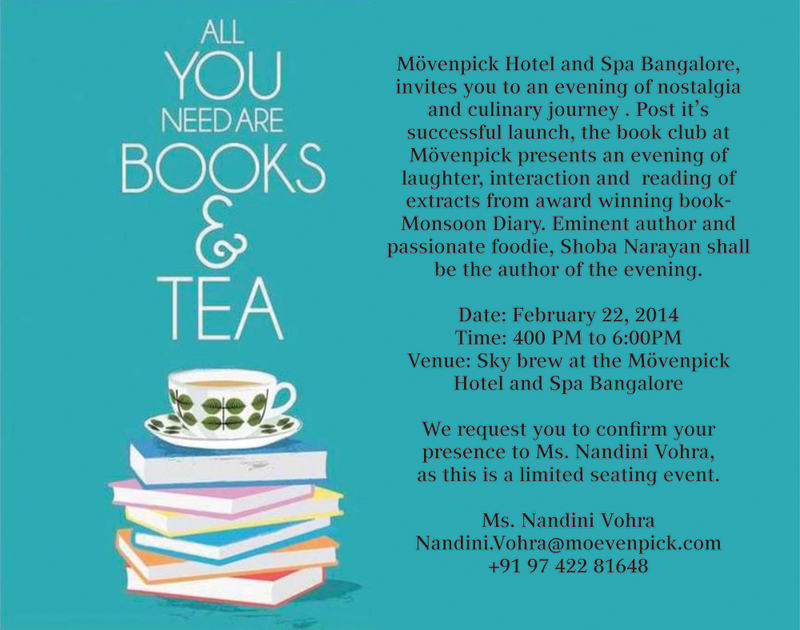 My friend, Meena runs a book club that is affiliated with the Moevenpick Hotel and Spa in Bangalore. Meena invited me to do a book reading at the hotel. Since there is a food element involved, I thought I would do something that I have not done in Bangalore– talk about and read from my first book, “Monsoon Diary: a memoir with recipes.” The hotel’s chef is making recipes from the book as well. Since someone asked, there is no fee for this. There will however be beautifully designed hardcover editions of Monsoon Diary for sale at a discounted price of Rs. 300. All proceeds of the sale will go to Unnati Bangalore, an NGO. The reason (besides the fact that they are consistently doing wonderful work) is because any donations that Unnati gets before March 31st will get a matching gift from a corporate. But hey, no obligation to buy the book. Come just to socialise. They have limited seating so please let her know if you would. Here is the menu of the high tea that will accompany the event. The chef has come up with some creative scrumptious eats that I for one am looking forward to sampling. Would have loved to have come for this, but already committed to the Black Tie Dinner. Alas! No worries, Nishka. See you there. Sounds interesting Shoba! is this a free event or is there a fee?